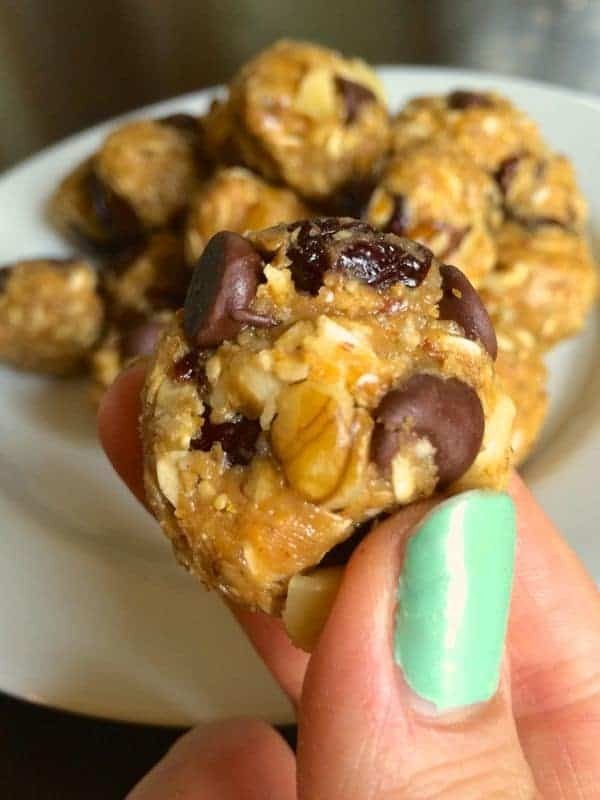 These naturally sweetened energy bites taste like a chocolate walnut brownie but are 100% gluten free, vegan and protein-packed. Dates are all the rage right now. Have you noticed? Trendy or not, my family has been eating dates my entire life. Growing up, we were never a big dessert family (another reason my weight loss journey isn’t quite the norm), but my mom always had dried fruit in the house. A common tradition in Middle Eastern families, she would often serve dried fruit like apricots, dates and figs with hot tea in lieu of a fudge brownie or slice of cake. 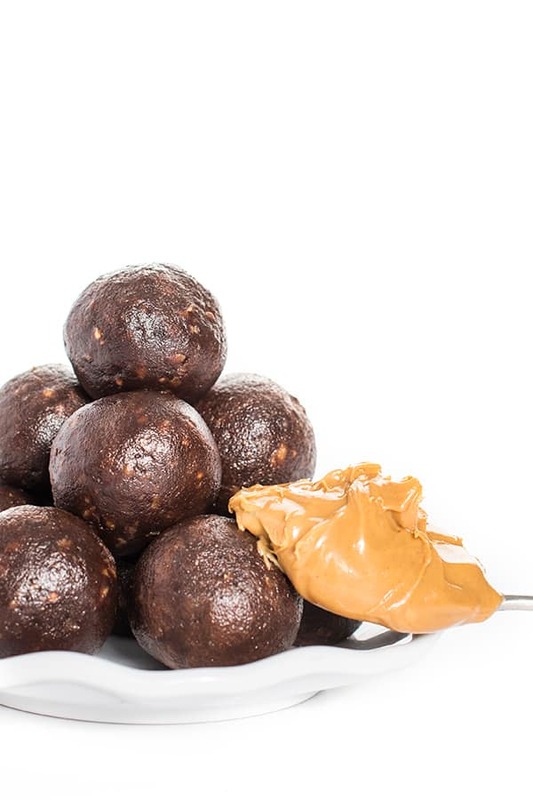 Speaking of brownie, these energy balls taste exactly like a chocolate walnut brownie minus the heavy, greasy, buttery guilt that typically comes with it. 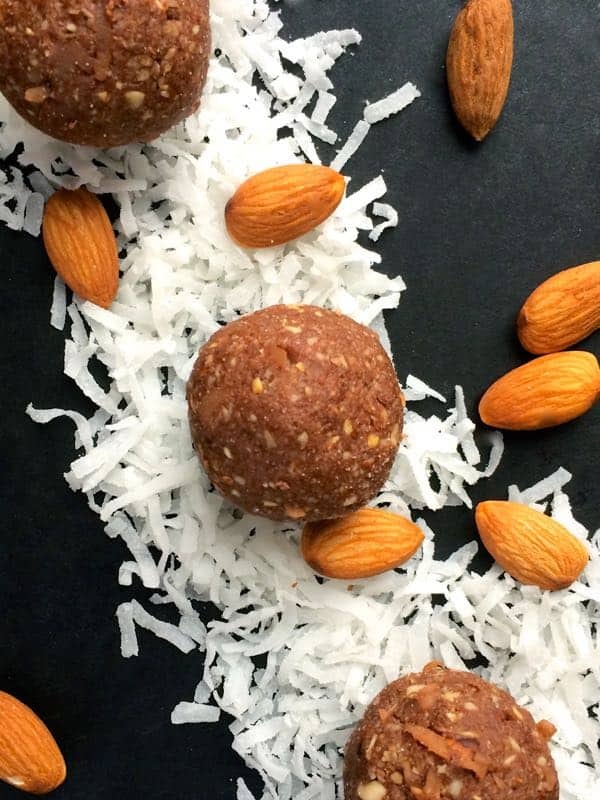 This recipe is inspired by my dear friend Ali who recently created these mouth-watering Almond Joy Energy Bites. Her gorgeous recipe was just the kick in the bum I needed to finally use up the dates sitting in my pantry. While I love all things almond joy, I decided to attempt replicating a chocolate walnut brownie which is probably my favorite dessert of all time. In fact, whenever I purchase protein bars, I almost always gravitate towards the brownie flavor. 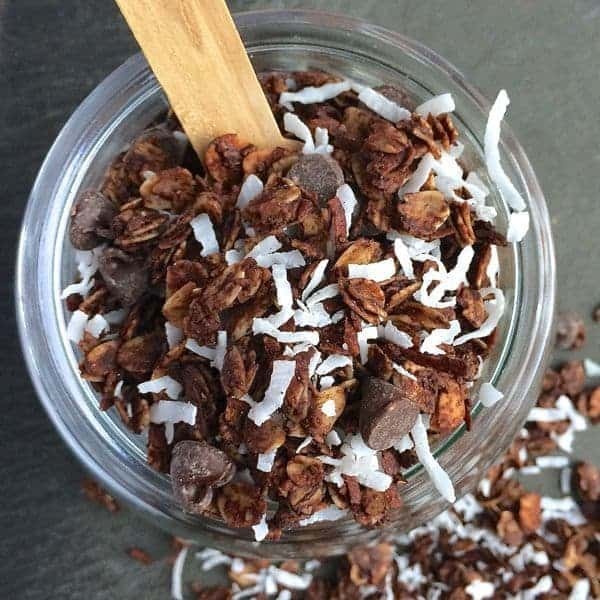 Packed with heart-healthy walnuts and antioxidant rich cocoa powder, these energy bites are great for stashing in your gym bag, storing in the diaper bag or keeping on hand for after school snacking. Dates are a natural energy source and the omega-3’s in the walnuts provide just enough healthy fat to keep you satisfied. Recipe inspired and adapted from Gimme Some Oven. Energy balls can be stored in an airtight container in the refrigerator for up to 7 days. Oh I’m so glad you liked them!! I’ve made A LOT of bites and these are hands down my favorite! 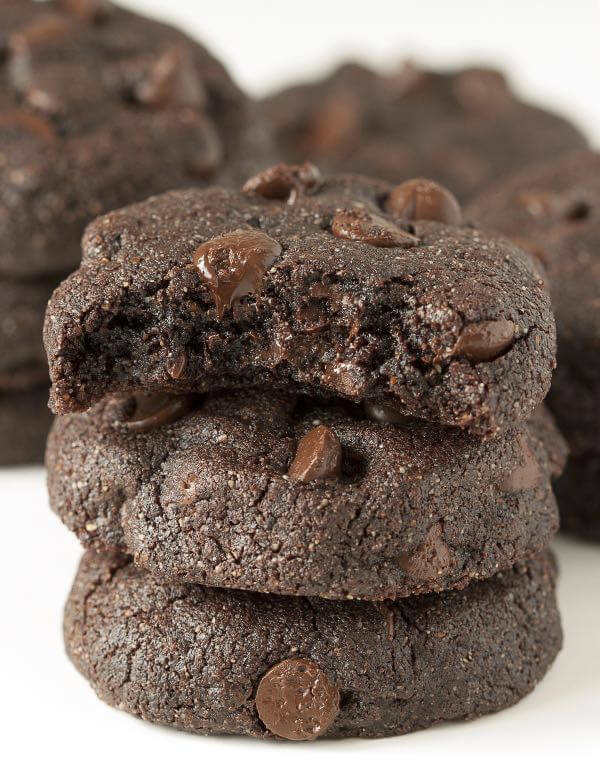 I make them with sunflower seeds and they are amazing!! Make them all the time. I’m so glad you enjoy them Nikki!! Would these also be good with hazelnuts instead of walnuts? Question: Approx how large do you think your balls are? I used 5/8 oz which is about 1 tablespoon. But I only got 14 balls. Also about how many dates do you think you are getting in a cup? Thanks. Hmm… Mine were about 1 tablespoon as well. As for how many dates in a cup, I would have to guess 20? So. I made these again today. This time I accidentally ran the walnuts through the food processor first until they were mealy. Then I added the salt, vanilla and dates (forgot the cocoa) ran that through and THEN remembered the cocoa (its not my day I guess). Sigh. So. Let me tell ya! This does NOT work! It is so sticky and gooey there’s just no way you’re making a ball out of this! HOWEVER, it made a delicious dip/spread for gram crackers and apples! My 18mo tried to eat it with a spoon…I followed suit. Yum! But alas, that seemed like the opposite of a healthy snack (ala spoon in the PB jar). I made another batch, altogether this time around, except I ran out of vanilla so I thought I needed to add SOMETHING. I opted for cinnamon. It takes it to a whole new level. Then of course, rolling it in the powdered PB like last time! LOL! I just LOVE these little delightful things! Too funny!!! I’m glad you found a way to enjoy them!!! Made them today and I love the sweet from the dates . I used almonds, cos I don´t like walnuts. The crunchy yet gooey is great! Oh I’m so glad you love them!! OMG!! I did it! I rolled them in PB2 (powdered peanut butter) because they were kinda sticky and I cried. I did. Just like a Reese’s laced brownie. Sigh. These have officially changed my life. You are a genius!!!! Trying this soon!